Messy Ponytail - all mine! I'm going camping at the beach this weekend, so it's back to shorts and flip-flops until Monday (gotta soak in the sun before it's gone). I'll be back next week! The trench coat was such a great find! The khaki is sold out at my nearest store :). Enjoy camping at the beach...sounds like fun! you TOTALLY look like a model! just gorgeous :-)! what a chic and timeless outfit- audrey hepburn would be proud. xoxo. Natasha: Really? They have so many at the store I went to. I hope yours gets more in stock! Great outfit! 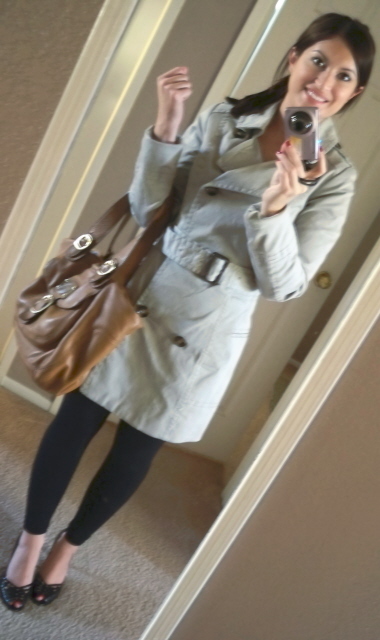 I love my trench coat! Have a great weekend! Love this look, Noelle! Aww, it won't be another month or so before I can wear my trench coats. When the time comes, I will definitely pair them with leggings and heels. I plan to wear leggings a lot this fall and winter. I have convinced myself that I really need a brown bag. The suggestion you gave me about how to wear my F21 white skirt is so great. I don't have any brown or gold pieces! ayyaa. Your hair looks nice, too! You look amazing! What a great classic piece and a fabulous find! Cupcake Couture: Thank you for reading and commenting! 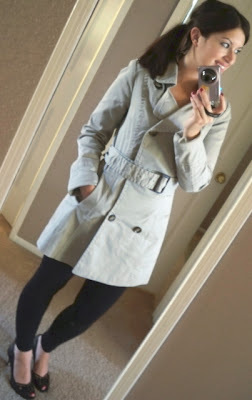 Amanda: Trench coats look chic on everyone ;) I'm happy you enjoy wearing yours too! Sydney: I plan on wearing leggings quite a bit too! It's funny, because I think I only wore them like two or three times last year. I didn't know how to pull them off without feeling very 80's ;) Now I think I've figured them out a little more so I can wear them to my liking. I'm glad you liked my advice on the lace skirt. You look gorgeous in it! Ashley and Kim: Thank you so much girls. OMG! That jacket is PERFECT on you!! I love it!!! A timeless classic look!! You look gorgeous. You reminded me that i need to take my trench out of the closet! You looks so awesome always! Enjoy your weekend! Obsessed, OBSESSED with this pretty look. I love the chic coat and gorgeous bag! What a great classic outfit! I think we like a lot of the same things..Chanel, high waisted skirts, skinny jeans! Looove the trench, you look gorgeous sweetie!! !